This half-day tour departs daily at 14.45 from April to October and at 14.15 from November to March. Hotel collection will be approximately 30 to 60 minutes before the tours departure time. To enjoy the sunset with fewer crowds visit between November and March. We are comparing Temple Of Poseidon and Cape Sounion Tour Prices from leading ticket suppliers and Try to find you Cheap tickets prices on the market. After a morning in the busy capital city you’ll probably be happy to take a trip into the calmer regions of Athens. With a comfortable air-conditioned coach you’ll leave behind the city centre and all its noise, travelling south along the exquisite Greek coastline. Onboard you’ll be accompanied by a friendly English-speaking guide. Remember to take a look out the window as you pass though some of Athens picturesque districts. Your guide will point out Varkiza, Glyfada, and Vouliagmeni neighbourhoods as you pass and answer any questions. This half-day tour takes you to a breath taking and historically significant part of Greece’s coastline, the Cape Sounion. Clearly the Ancient Greeks fell in love with this magical location too because it’s in this corner of the Saronic Gulf that they chose to build the beautiful Temple of Poseidon. Although this temple is thousands of years old it’s strong marble columns are still standing and you will be able to tour the site with your knowledgeable guide. After visiting the archaeological site and taking your pictures, you’ll return to Athens by coach and, with a little luck, catch the sunset on the way. If your looking for a trip out of Athens, or to see some of the Greek coastline then this is a pleasant half-day tour. Good for historians, photographers and nature lovers, you will get to see one of the 3 temples which make up the ‘Holy Triangle’ as well as fantastic scenery. Family friendly and suitable for people of all ages. People with severe walking difficulties may find the archaeological site challenging. 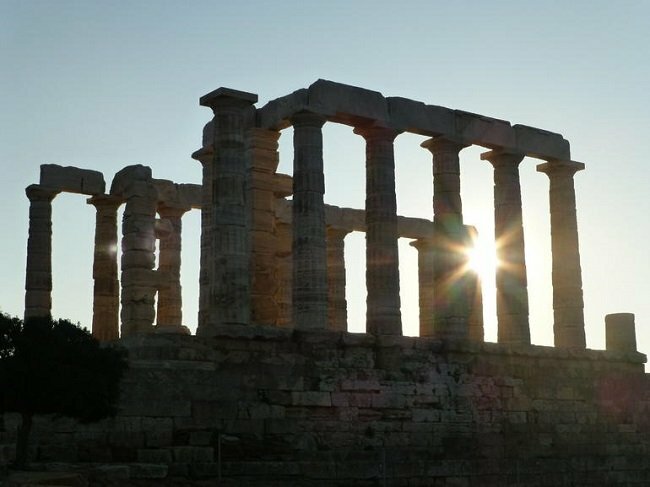 Your Experience With Temple Of Poseidon and Cape Sounion Tour? Experience breath taking views of the Saronic Gulf from the comfort of a luxury air-conditioned bus. Tour the picturesque Cape Souion and marvel at the ancient remains of the Temple of Poseidon. Learn about the Temple of Poseidon and the Holy Triangle from a qualified historian guide. Be dazzled by the crystal-clear waters of a steep seaside cliffs. See the sunset on the Greek coastline and take stunning holiday snapshots. What Temple Of Poseidon and Cape Sounion Tour Includes? Qualified English and Spanish-speaking guide. Entrance fee to the archaeological site at Cape Sounion. Round trip transportation by luxury air-conditioned coach. Hotel pick-up and drop-off from centrally located hotels in Athens. We recommend bringing a camera, a bottle of water and comfortable walking shoes as the ground is uneven in parts of the Temple of Poseidon. Travelers Reviews about Temple Of Poseidon and Cape Sounion Tour? Travellers have given this half-day tour a 4.5 out of 5-star rating. On TripAdvisor and Viator it has a positive 4-star rating. People who have participated in this tour say that it’s a fantastic trip out of Athens. Some point out that it is a fairly long bus journey but also say that the scenery is stunning. Overall travellers agree that the Temple of Poseidon and Cape Sounion are defiantly worth seeing. Collection is not available from private apartments, ports, or cruise ship terminals. Come prepared with a sunhat, sunscreen and a bottle of water during the summer. No food or drinks are included in this tour. Ticket confirmation will be sent via email on the same day that the booking is made. Tickets are accepted in printed or mobile form. You will be eligible for a full refund up to 24 hours in advance if your purchase was made through Get Your Guide. Full refunds are available up to 7 days in advance with Viator and partial refunds up to 2 days in advance. Please check the cancellation policies for other tour suppliers. A pick-up and drop-off service is available for certain hotels in Athens, you can check with your tour provider.